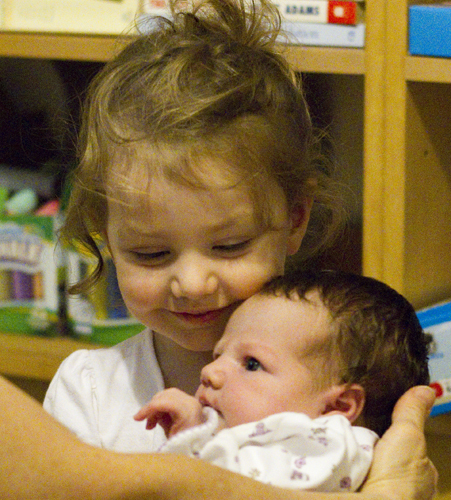 We welcomed Evelyn Bea into our family in the early morning of July 28, 2011. It was a bit of a traumatic labor and delivery, for all involved, and Evelyn was minutes away from entering the world via emergency c-section instead of the calm, natural birth I had anticipated. But thanks to the most wonderful, attentive, observant nurse I have ever had, we were able to deliver her naturally just as the c-section team was arriving. She was born with the cord wrapped around her neck and crimped in the crook of her arm, but completely healthy and pink and lovely. Evelyn is a family name that we love, and Bea, with its Latin roots, means “she makes others happy.” We were undecided on her middle name until we looked up this meaning and we know right away it was perfect. Having a new person in the household, someone so sweet and perfect as only a newborn can be, has brought out the loviness in our whole family. The older two are completely smitten with their new baby and so accepting of her tiny needs. 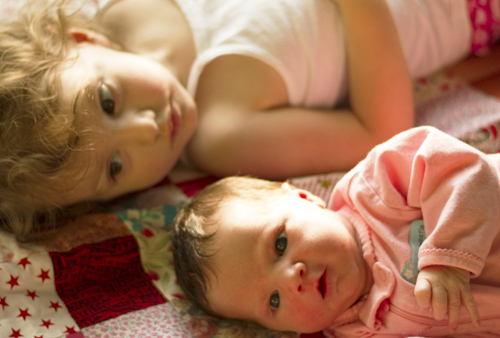 It is a heartwarming sight to catch the two-and-a-half year old crouched down, whispering comforts to her new sister any time she makes the slightest whimper. The quilt they are laying on was a present- at the hospital where she was born, every new baby goes home with a quilt from Project Linus. So nice! This week daddy has gone back to work, we are back on an early bird schedule and I have to say, after a couple of weeks of being in pajamas until 3 in the afternoon, I am so glad to be here! I am ready to get back to productivity, ready to jump into a new year of homeschooling and ready to tackle some projects in my studio that were shoved aside in favor of tiny-baby knitting projects over the past month or two.